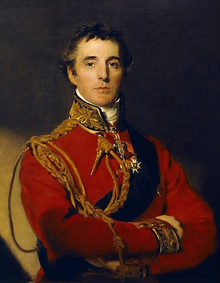 As for his private life,Wellington was not known for being social. In 1806 he married Catherine “Kitty” Pakenham in Dublin. Initially, he’d been turned down for being in debt. Later, he married her because he considered himself pressed to do so but was disappointed by his over-emotional, easily depressed wife who was often in debt and an incompetent housekeeper. They lived apart for long periods while he was on campaign. The unaffected and simple-minded duchess died in 1831. They had two sons.